Colours and Esox. As the name already is telling you, this article is about colours. 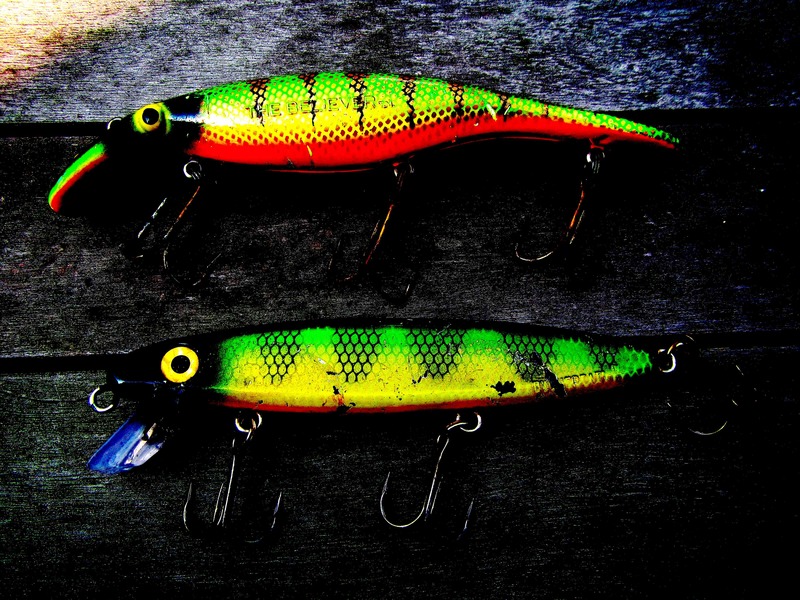 Are colours important to Pike and Muskie fishing? If this was a question you would ask me, I would say yes, but I always would say no. Let’s explain why. In the lure making industry, there is a never ending battle about colours. If you open a fishing catalogue nowadays, and find lures in there, they are available in all different kind of patterns you can imagine. There is a reason for this. As anglers we never know what to put on. Agree with me or not, It’s always the same story. You go onto a water or perhaps from shore, grab a lure out of your tacklebox… and what happends next? Correctly! Inside your mind you are thinking wich colour to put on. You are probably like me, too many lures in one box, and in different colours. Firetiger, black perch, green orange, red head, purple, black, blue silver shiner, holoform clown, superman, bumble bee jailbird, and the list goes on, and on, and on. Let’s put it this way. Let’s forget about colours. Make things easier for yourself. Let’s talk about contrast! Have you ever read an article wich said that colours ”fade” when they reach certain depths? Colours fade, but contrast doesn’t! 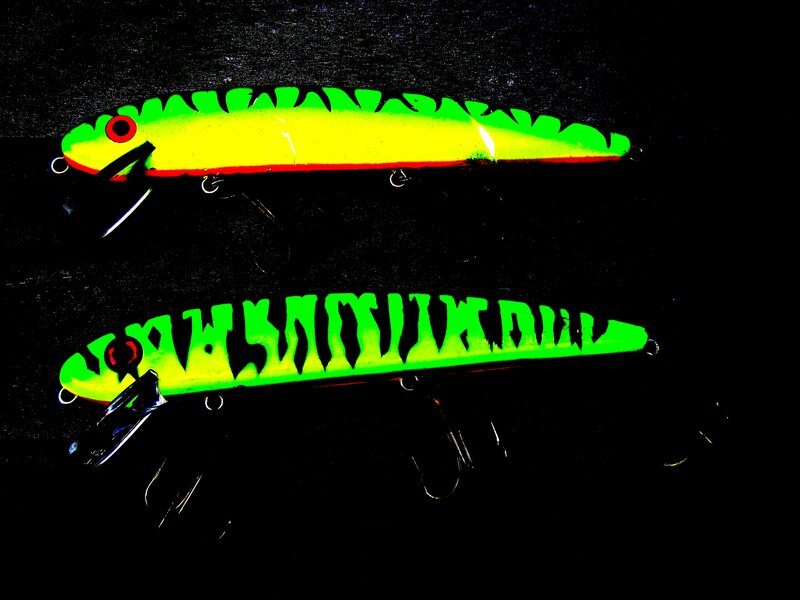 In fact, there is no such thing any Pike or Muskie go more crazy about that this. Imagine yourself in the water, sitting on the bottom of a lake, river, whatever. Look up, look up above to the surface of the water. There are baitfish surrounded in the surface column of the water. What do you see? Exactly! You see contours of baitfish, and their bodies contrasting from the sun in the water. There you have it! Another reason why Esox like contrast. Some people believe (and I believed that too) that fish can actually see colours, and see the difference between blue or green. Well, have you ever seen a blue fish? No but you have seen the glimpse of the baitfish who look a bit like blue right? But does for example, a Pike know that it’s blue? Or do they just see…. you know what’s coming right? Contrast! On the pictures below I’ve added a contrast filter, so you can see now, what a fish would normally see! Two virtually the same lures, but each with their own appearence! Top: 6” Grandma. Bottom: 6” Jake. Nearly the same, but different contrast! 8” Believer & 7” ShallowRaider. Two 8” Jakes. Top one has target points, bottom one loads of flash. Right, so now we know that we need to look out for a bait that has this feature. There is a simple trick for this that I always use when buying new lures on the internet or in a tackle store, and however this may sound odd to you, it does actually work (you can try it on the pictures above as well). When you find yourself in front of the lures that you want to buy, close your eyes. Not fully, but just about where you can still see some light. If you are looking at the lures, you may notice something. There are ones you can see, and ones you cannot. They ones you can see are the right ones to buy. They have contrast on them. Simple isn’t it? And there you have the main reason why all my lures catch fish. Now let’s imagine the situations you find yourself in when fishing. 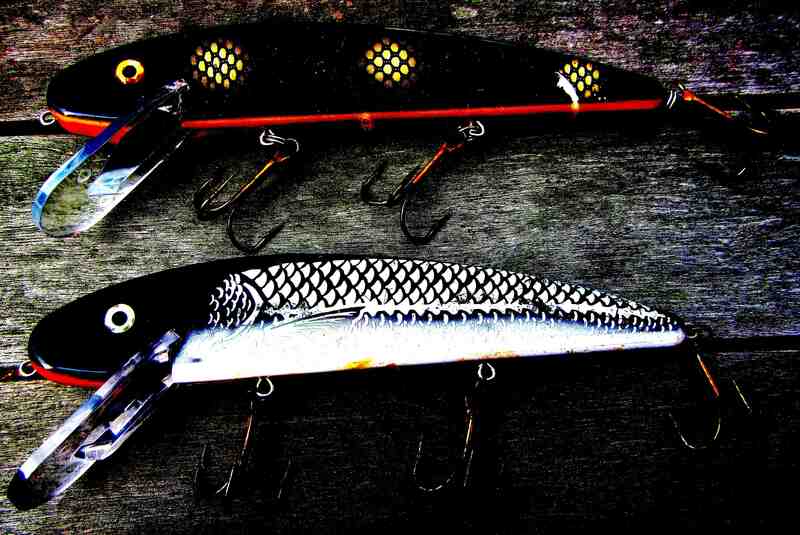 The type of lure contrast you are about to put on depends on many things. The colour of the water. The time of year and day you find yourself in. Four factors you should pay attention to. It’s that simple. In fact at Joe Bucher Outdoors they actually made a pretty cool colour scheme of it, on wich lure to use in what conditions etc. Have a look at it down below. It doesn’t come easier than this! This picture above is a great example on lure colours and their contrast. If you stick to the guide above, wich is often right, you can’t go wrong. I can tell you loads of stuff about this, but it visualises things directly easier with this scheme. But remember, it is fishing, and in the end you can’t decide what lure the fish want. That’s upto the fish for them to decide, but you can adapt to the conditions, and thats a great advantage if you ask me. 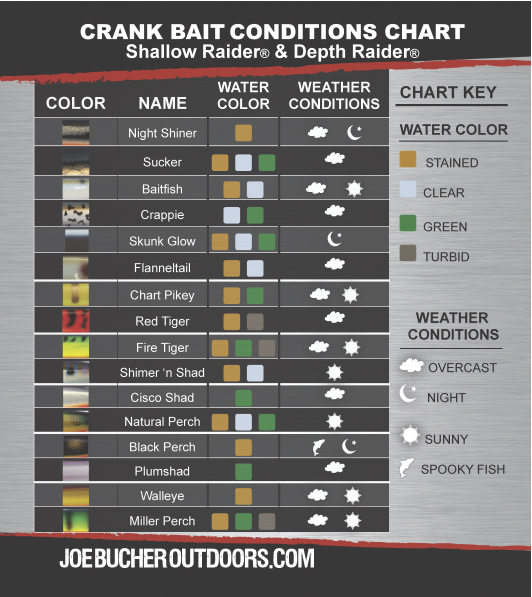 The colour scheme says ”Shallow raider & Depth raider”, but of course, this works for all your type of lures! Save this little scheme on your smartphone, and carry it around next time you find yourself in a positiion where you can’t decide wich lure to put on!